Map of the pre-Roman Iron Age in Northern Europe showing cultures associated with Proto-Germanic, c. 500 BC. The red shows the area of the preceding Nordic Bronze Age in Scandinavia; the magenta-colored area towards the south represents the Jastorf culture of the North German Plain. Proto-Germanic (abbreviated PGmc; also called Common Germanic) is the reconstructed proto-language of the Germanic branch of the Indo-European languages. Proto-Germanic developed from pre-Proto-Germanic into three branches during the first half of the first millennium of the Common Era: West Germanic, East Germanic and North Germanic, which however remained in contact over a considerable time, especially the Ingvaeonic languages (including English), which arose from West Germanic dialects and remained in continued contact with North Germanic. A defining feature of Proto-Germanic is the completion of Grimm's law, a set of sound changes that occurred between its status as a dialect of Proto-Indo-European and its gradual divergence into a separate language. As it is probable that the development of this sound shift spanned a considerable time (several centuries), Proto-Germanic cannot adequately be reconstructed as a simple node in a tree model but rather represents a phase of development that may span close to a thousand years. The end of the Common Germanic period is reached with the beginning of the Migration Period in the fourth century. The alternative term "Germanic parent language" may be used to include a larger scope of linguistic developments, spanning the Nordic Bronze Age and Pre-Roman Iron Age in Northern Europe (second to first millennia BC) to include "Pre-Germanic" (PreGmc), "Early Proto Germanic" (EPGmc) and "Late Proto-Germanic" (LPGmc). While Proto-Germanic refers only to the most recent reconstruction of the common ancestor of Germanic languages, the Germanic parent language refers to the entire journey that the dialect of Proto-Indo-European that would become Proto-Germanic underwent through the millennia. The Proto-Germanic language is not directly attested by any coherent surviving texts; it has been reconstructed using the comparative method. Fragmentary direct attestation exists of (late) Common Germanic in early runic inscriptions (specifically the second-century AD Vimose inscriptions and the second-century BC Negau helmet inscription), and in Roman Empire era transcriptions of individual words (notably in Tacitus' Germania, c. 90 CE). Some sources also give a date of 750 BC for the earliest expansion out of southern Scandinavia along the North Sea coast towards the mouth of the Rhine. The early East Germanic expansion (1st and 2nd centuries AD): Jastorf culture (blue), Oksywie culture (red), Przeworsk culture (yellow/orange); eastward expansion of the Wielbark culture (light-red/orange). The Proto-Germanic language developed in southern Scandinavia (Denmark, south Sweden and southern Norway), the Urheimat (original home) of the Germanic tribes. It is possible that Indo-European speakers first arrived in southern Scandinavia with the Corded Ware culture in the mid-3rd millennium BC, developing into the Nordic Bronze Age cultures by the early 2nd millennium BC. Proto-Germanic developed out of pre-Proto-Germanic during the Pre-Roman Iron Age of Northern Europe. According to the Germanic substrate hypothesis, it may be influenced by non-Indo-European cultures, such as the Funnelbeaker culture, but the sound change in the Germanic languages known as Grimm's law points to a non-substratic development away from other branches of Indo-European. [note 1] Proto-Germanic itself was likely spoken after c. 500 BC, and Proto-Norse from the 2nd century AD and later is still quite close to reconstructed Proto-Germanic, but other common innovations separating Germanic from Proto-Indo-European suggest a common history of pre-Proto-Germanic speakers throughout the Nordic Bronze Age. Early Germanic expansion in the Pre-Roman Iron Age (5th to 1st centuries BC) placed Proto-Germanic speakers in contact with the Continental Celtic La Tène horizon. A number of Celtic loanwords in Proto-Germanic have been identified. By the 1st century AD, Germanic expansion reached the Danube and the Upper Rhine in the south and the Germanic peoples first entered the historical record. At about the same time, extending east of the Vistula (Oksywie culture, Przeworsk culture), Germanic speakers came into contact with early Slavic cultures, as reflected in early Germanic loans in Proto-Slavic. By the 3rd century, Late Proto-Germanic speakers had expanded over significant distance, from the Rhine to the Dniepr spanning about 1,200 km (700 mi). The period marks the breakup of Late Proto-Germanic and the beginning of the (historiographically-recorded) Germanic migrations. The first coherent text recorded in a Germanic language is the Gothic Bible, written in the later 4th century in the language of the Thervingi Gothic Christians, who had escaped persecution by moving from Scythia to Moesia in 348. The earliest available coherent texts (conveying complete sentences, including verbs) in Proto-Norse begin in c. 400 in runic inscriptions (such as the Tune Runestone). The delineation of Late Common Germanic from Proto-Norse at about that time is largely a matter of convention. Early West Germanic text is available from the 5th century, beginning with the Frankish Bergakker inscription. The evolution of Proto-Germanic from its ancestral forms, beginning with its ancestor Proto-Indo-European, began with the development of a separate common way of speech among some geographically nearby speakers of a prior language and ended with the dispersion of the proto-language speakers into distinct populations with mostly independent speech habits. Between the two points, many sound changes occurred. Phylogeny as applied to historical linguistics involves the evolutionary descent of languages. The phylogeny problem is the question of what specific tree, in the tree model of language evolution, best explains the paths of descent of all the members of a language family from a common language, or proto-language (at the root of the tree) to the attested languages (at the leaves of the tree). The Germanic languages form a tree with Proto-Germanic at its root that is a branch of the Indo-European tree, which in turn has Proto-Indo-European at its root. Borrowing of lexical items from contact languages makes the relative position of the Germanic branch within Indo-European less clear than the positions of the other branches of Indo-European. In the course of the development of historical linguistics, various solutions have been proposed, none certain and all debatable. In the evolutionary history of a language family, philologists consider a genetic "tree model" appropriate only if communities do not remain in effective contact as their languages diverge. Early Indo-European had limited contact between distinct lineages, and, uniquely, the Germanic subfamily exhibited a less treelike behaviour, as some of its characteristics were acquired from neighbours early in its evolution rather than from its direct ancestors. The internal diversification of West Germanic developed in an especially non-treelike manner. Proto-Germanic is generally agreed to have begun about 500 BC. Its hypothetical ancestor between the end of Proto-Indo-European and 500 BC is termed Pre-Proto-Germanic. Whether it is to be included under a wider meaning of Proto-Germanic is a matter of usage. Winfred P. Lehmann regarded Jacob Grimm's "First Germanic Sound Shift", or Grimm's law, and Verner's law, (which pertained mainly to consonants and were considered for many decades to have generated Proto-Germanic) as pre-Proto-Germanic and held that the "upper boundary" was the fixing of the accent, or stress, on the root syllable of a word, typically on the first syllable. Proto-Indo-European had featured a moveable pitch-accent comprising "an alternation of high and low tones" as well as stress of position determined by a set of rules based on the lengths of a word's syllables. The fixation of the stress led to sound changes in unstressed syllables. For Lehmann, the "lower boundary" was the dropping of final -a or -e in unstressed syllables; for example, post-PIE *wóyd-e > Gothic wait, "knows". Antonsen agreed with Lehmann about the upper boundary but later found runic evidence that the -a was not dropped: ékwakraz … wraita, "I, Wakraz, … wrote (this)". He says: "We must therefore search for a new lower boundary for Proto-Germanic." Antonsen's own scheme divides Proto-Germanic into an early stage and a late stage. The early stage includes the stress fixation and resulting "spontaneous vowel-shifts" while the late stage is defined by ten complex rules governing changes of both vowels and consonants. By 250 BC Proto-Germanic had branched into five groups of Germanic: two each in the West and the North and one in the East. The following changes are known or presumed to have occurred in the history of Proto-Germanic in the wider sense from the end of Proto-Indo-European up to the point that Proto-Germanic began to break into mutually unintelligible dialects. The changes are listed roughly in chronological order, with changes that operate on the outcome of earlier ones appearing later in the list. The stages distinguished and the changes associated with each stage rely heavily on Ringe 2006, Chapter 3, "The development of Proto-Germanic". Ringe in turn summarizes standard concepts and terminology. This stage began with the separation of a distinct speech, perhaps while it was still forming part of the Proto-Indo-European dialect continuum. It contained many innovations that were shared with other Indo-European branches to various degrees, probably through areal contacts, and mutual intelligibility with other dialects would have remained for some time. It was nevertheless on its own path, whether dialect or language. The actual pronunciation of the "palatovelar" and "velar" series is not reconstructible; it may be that the "palatovelars" were actually plain velars, and the "velars" were pronounced even farther back (post-velar or uvular) so it may be more accurate to say that, for example, /k/ > /ḱ/ (see e.g. Ringe 2006, p. 87). Some also claim that the two series may not even have been distinct in PIE. See centum and satem languages. /n̥/ > /un/ — *n̥tér "inside" > *untér > *under "among"
An epenthetic /s/ was inserted already in PIE after dental consonants when they were followed by a suffix beginning with a dental. This sequence now becomes /TsT/ > /ts/ > /ss/ — *wid-tós "known" (pronounced *widstos) > *witstós > *wissós > *wissaz "certain"
Geminate consonants are shortened after a consonant or a long vowel — *káyd-tis "act of calling" (pronounced *káydstis) > *káyssis > *káysis > *haisiz "command"
/h₂e/ > /a/, /h₂V/ > /V/ otherwise — *h₂énti "in front" > (with shift of accent) *antí > *andi "in addition"
Labiovelars are delabialised next to /u/ (or /un/) and before /t/ — *gʷʰénti- ~ *gʷʰn̥tí- "killing" > *gʷʰúntis > *gʰúntis > *gunþiz "battle"
This rule continued to operate into the Proto-Germanic period. This stage began its evolution as a dialect of Proto-Indo-European that had lost its laryngeals and had five long and six short vowels as well as one or two overlong vowels. The consonant system was still that of PIE minus palatovelars and laryngeals, but the loss of syllabic resonants already made the language markedly different from PIE proper. Mutual intelligibility might have still existed with other descendants of PIE, but it would have been strained, and the period marked the definitive break of Germanic from the other Indo-European languages and the beginning of Germanic proper, containing most of the sound changes that are now held to define this branch distinctively. This stage contained various consonant and vowel shifts, the loss of the contrastive accent inherited from PIE for a uniform accent on the first syllable of the word root, and the beginnings of the reduction of the resulting unstressed syllables. Grimm's law: Chain shift of the three series of plosives. Voiced plosives had already been devoiced before a voiceless obstruent prior to this stage. Labiovelars were delabialised before /t/. Voiceless plosives become fricatives, unless preceded by another obstruent. In a sequence of two voiceless obstruents, the second obstruent remains a plosive. Since the second of two obstruents is unaffected, the sequences /sp/, /st/, /sk/, and /skʷ/ remain. /bt/, /bʰt/, /pt/ > /ɸt/ — *kh₂ptós "grabbed" > *kəptós > *həftós > *haftaz "captive"
/gʷ/ > /kʷ/ — *gʷémeti "(s)he will step, subj." > *kʷémeþi > *kwimidi "(s)he comes"
/dʰ/ > /d/ ([d,ð]) — *dʰóh₁mos "thing put" > *dṓmos > *dōmaz "judgement"
/gʷʰ/ > /gʷ/ ([gʷ,ɣʷ]) — *sóngʷʰos "chant" > *sóngʷos > *sangwaz "song"
All words become stressed on their first syllable. The PIE contrastive accent is lost, phonemicising the voicing distinction created by Verner's law. /ln/ > /ll/ — *pl̥h₁nós "full" > *fulnos > *fullos > *fullaz. This development postdated contact with the Samic languages, as is shown by the loanword *pulna > Proto-Samic *polnē "hill(ock), mound". /e/ before /r/ later becomes /ɑ/ but not until after the application of i-mutation. The sequence /iji/ becomes /iː/ — *gʰósteyes "strangers, nom. pl." > *gostiyiz > *gostīz > *gastīz "guests"
/o/, /a/ > /ɑ/ — *gʰóstis "stranger" > *gostiz > *gastiz "guest"; *kátus "fight" > *haþuz "battle"
By this stage, Germanic had emerged as a distinctive branch and had undergone many of the sound changes that would make its later descendants recognisable as Germanic languages. It had shifted its consonant inventory from a system that was rich in plosives to one containing primarily fricatives, had lost the PIE mobile pitch accent for a predictable stress accent, and had merged two of its vowels. The stress accent had already begun to cause the erosion of unstressed syllables, which would continue in its descendants. The final stage of the language included the remaining development until the breakup into dialects and, most notably, featured the development of nasal vowels and the start of umlaut, another characteristic Germanic feature. That followed the earliest contact with the Romans since Latin Rōmānī was borrowed as *Rūmānīz and then shifted to *Rūmōnīz. A number of loanwords in the Finnic and Samic demonstrate earlier *e, e.g. /e/ > /i/ when followed by a syllable-final nasal — *en "in" > *in; *séngʷʰeti "(s)he chants" > *sengʷidi > *singwidi "(s)he sings"
/j/ is lost between vowels except after /i/ and /w/ (but it is lost after syllabic /u/). The two vowels that come to stand in hiatus then contract to long vowels or diphthongs — *-oyh₁m̥ "thematic optative 1sg sg." > *-oyum > *-ayų > *-aų; *áyeri "in the morning" > *ayiri > *airi "early"
Loans into Proto-Germanic from other (known) languages or from Proto-Germanic into other languages can be dated relative to each other by which Germanic sound laws have acted on them. Since the dates of borrowings and sound laws are not precisely known, it is not possible to use loans to establish absolute or calendar chronology. Most loans from Celtic appear to have been made before or during the Germanic Sound Shift. For instance, one specimen *rīks 'ruler' was borrowed from Celtic *rīxs 'king' (stem *rīg-), with g → k. It is clearly not native because PIE *ē → ī is typical of not Germanic but Celtic languages. Another is *walhaz "foreigner; Celt" from the Celtic tribal name Volcae with k → h and o → a. Other likely Celtic loans include *ambahtaz 'servant', *brunjǭ 'mailshirt', *gīslaz 'hostage', *īsarną 'iron', *lēkijaz 'healer', *laudą 'lead', *Rīnaz 'Rhine', and *tūnaz, tūną 'fortified enclosure'. These loans would likely have been borrowed during the Celtic Hallstatt and early La Tène cultures when the Celts dominated central Europe, although the period spanned several centuries. From East Iranian came *hanapiz 'hemp' (compare Khotanese kaṃhā, Ossetian gæn(æ) ‘flax’), *humalaz, humalǭ 'hops' (compare Osset xumællæg), *keppǭ ~ skēpą 'sheep' (compare Pers čapiš 'yearling kid'), *kurtilaz 'tunic' (cf. Osset kwəræt 'shirt'), *kutą 'cottage' (compare Pers kad 'house'), *paidō 'cloak', *paþaz 'path' (compare Avestan pantā, gen. pathō), and *wurstwa 'work' (compare Av vərəštuua). The words could have been transmitted directly by the Scythians from the Ukraine plain, groups of whom entered Central Europe via the Danube and created the Vekerzug Culture in the Carpathian Basin (6th to 5th centuries BC), or by later contact with Sarmatians, who followed the same route. Unsure is *marhaz 'horse', which was either borrowed directly from Scytho-Sarmatian or through Celtic mediation. Numerous loanwords believed to have been borrowed from Proto-Germanic are known in the non-Germanic languages spoken in areas adjacent to the Germanic languages. The heaviest influence has been on the Finnic languages, which have received hundreds of Proto-Germanic or pre-Proto-Germanic loanwords. Well-known examples include PGmc *druhtinaz 'warlord' (compare Finnish ruhtinas), *hrengaz (later *hringaz) 'ring' (compare Finn rengas, Estonian rõngas), *kuningaz 'king' (compare Finn kuningas), *lambaz 'lamb' (compare Finn lammas), *lunaz 'ransom' (compare Finn lunnas). Loanwords into the Samic languages, Baltic languages and Slavic languages are also known. Theo Vennemann has hypothesized a Basque substrate and a Semitic superstrate in Germanic; however, his speculations, too, are generally rejected by specialists in the relevant fields. Research in Germanic etymology continues, and many Germanic words whose origins were previously unclear or controversial now have plausible explanations in terms of reconstructed Indo-European words and morphology. Thus, the proportion of Germanic words without any plausible etymological explanation has decreased over time. Estimates of that proportion are typically outdated or inflated, as many of these proposals were unknown when scholars were compiling lists of unexplained Germanic words. See also the Phonological stages section above. Voiced obstruents appear as b, d, g; this does not imply any particular analysis of the underlying phonemes as plosives /b/, /d/, /ɡ/ or fricatives /β/, /ð/, /ɣ/. In other literature, they may be written as graphemes with a bar to produce ƀ, đ, ǥ.
Unvoiced fricatives appear as f, þ, h (perhaps /ɸ/, /θ/, /x/). /x/ may have become /h/ in certain positions at a later stage of Proto-Germanic itself. Similarly for /xʷ/, which later became /hʷ/ or /ʍ/ in some environments. Labiovelars appear as kw, hw, gw; this does not imply any particular analysis as single sounds (e.g. /kʷ/, /xʷ/, /ɡʷ/) or clusters (e.g. /kw/, /xw/, /ɡw/). The yod sound appears as j /j/. Note that the normal convention for representing this sound in Proto-Indo-European is y; the use of j does not imply any actual change in the pronunciation of the sound. Long vowels are denoted with a macron over the letter, e.g. ō. When a distinction is necessary, /ɛː/ and /eː/ are transcribed as ē¹ and ē² respectively. ē¹ is sometimes transcribed as æ or ǣ instead, but this is not followed here. Overlong vowels appear with circumflexes, e.g. ô. In other literature they are often denoted by a doubled macron, e.g. ō̄. Nasal vowels are written here with an ogonek, following Don Ringe's usage, e.g. ǫ̂ /õːː/. Most commonly in literature, they are denoted simply by a following n. However, this can cause confusion between a word-final nasal vowel and a word-final regular vowel followed by /n/, a distinction which was phonemic. Tildes (ã, ĩ, ũ...) are also used in some sources. Diphthongs appear as ai, au, eu, iu, ōi, ōu and perhaps ēi, ēu. However, when immediately followed by the corresponding semivowel, they appear as ajj, aww, eww, iww. u is written as w when between a vowel and j. This convention is based on the usage in Ringe 2006. Long vowels followed by a non-high vowel were separate syllables and are written as such here, except for ī, which is written ij in that case. [ŋ] was an allophone of /n/ before velar obstruents. [ŋʷ] was an allophone of /n/ before labiovelar obstruents. [β], [ð] and [ɣ] were allophones of /b/, /d/ and /ɡ/ in certain positions (see below). The phoneme written as f was probably still realised as a bilabial fricative (/ɸ/) in Proto-Germanic. Evidence for this is the fact that in Gothic, word-final b (which medially represents a voiced fricative) devoices to f and also Old Norse spellings such as aptr [ɑɸtr], where the letter p rather than the more usual f was used to denote the bilabial realisation before /t/. Grimm's law as applied to pre-proto-Germanic is a chain shift of the original Indo-European plosives. Verner's Law explains a category of exceptions to Grimm's Law, where a voiced fricative appears where Grimm's Law predicts a voiceless fricative. The discrepancy is conditioned by the placement of the original Indo-European word accent. p, t, and k did not undergo Grimm's law after a fricative (such as s) or after other plosives (which were shifted to fricatives by the Germanic spirant law); for example, where Latin (with the original t) has stella "star" and octō "eight", Middle Dutch has ster and acht (with unshifted t). This original t merged with the shifted t from the voiced consonant; that is, most of the instances of /t/ came from either the original /t/ or the shifted /t/. Verner's law is usually reconstructed as following Grimm's law in time, and states that unvoiced fricatives: /s/, /ɸ/, /θ/, /x/ are voiced when preceded by an unaccented syllable. The accent at the time of the change was the one inherited from Proto-Indo-European, which was free and could occur on any syllable. For example, PIE *bʰréh₂tēr > PGmc. *brōþēr "brother" but PIE *meh₂tḗr > PGmc. *mōdēr "mother". The voicing of some /s/ according to Verner's Law produced /z/, a new phoneme. Sometime after Grimm's and Verner's law, Proto-Germanic lost its inherited contrastive accent, and all words became stressed on their root syllable. This was generally the first syllable unless a prefix was attached. The loss of the Proto-Indo-European contrastive accent got rid of the conditioning environment for the consonant alternations created by Verner's law. Without this conditioning environment, the cause of the alternation was no longer obvious to native speakers. The alternations that had started as mere phonetic variants of sounds became increasingly grammatical in nature, leading to the grammatical alternations of sounds known as Grammatischer Wechsel. For a single word, the grammatical stem could display different consonants depending on its grammatical case or its tense. As a result of the complexity of this system, significant levelling of these sounds occurred throughout the Germanic period as well as in the later daughter languages. Already in Proto-Germanic, most alternations in nouns were leveled to have only one sound or the other consistently throughout all forms of a word, although some alternations were preserved, only to be levelled later in the daughters (but differently in each one). Alternations in noun and verb endings were also levelled, usually in favour of the voiced alternants in nouns, but a split remained in verbs where unsuffixed (strong) verbs received the voiced alternants while suffixed (weak) verbs had the voiceless alternants. Alternation between the present and past of strong verbs remained common and was not levelled in Proto-Germanic, and survives up to the present day in some Germanic languages. "The resulting /x/ or /xʷ/ were reduced to /h/ and /hʷ/ in word-initial position." "Then, Proto-Germanic already had long consonants … but they contrasted with short ones only word-medially. Moreover, they were not very frequent and occurred only intervocally almost exclusively after short vowels." The voiced phonemes /b/, /d/, /ɡ/ and /ɡʷ/ are reconstructed with the pronunciation of stops in some environments and fricatives in others. The pattern of allophony is not completely clear, but generally is similar to the patterns of voiced obstruent allophones in languages such as Spanish. The voiced fricatives of Verner's Law (see above), which only occurred in non-word-initial positions, merged with the fricative allophones of /b/, /d/, /ɡ/ and /ɡʷ/. Older accounts tended to suggest that the sounds were originally fricatives and later "hardened" into stops in some circumstances. However, Ringe notes that this belief was largely due to theory-internal considerations of older phonological theories, and in modern theories it is equally possible that the allophony was present from the beginning. Word-initial /b/ and /d/ were stops [b] and [d]. A good deal of evidence, however, indicates that word-initial /ɡ/ was [ɣ], subsequently developing to [ɡ] in a number of languages. This is clearest from developments in Anglo-Frisian and other Ingvaeonic languages. Modern Dutch still preserves the sound of [ɣ] in this position. Plosives appeared after homorganic nasal consonants: [mb], [nd], [ŋɡ], [ŋʷɡʷ]. This was the only place where a voiced labiovelar [ɡʷ] could still occur. When geminate, they were pronounced as stops [bb], [dd], [ɡɡ]. This rule continued to apply at least into the early West Germanic languages, since the West Germanic gemination produced geminated plosives from earlier voiced fricatives. /d/ was [d] after /l/ or /z/. Evidence for /d/ after /r/ is conflicting: it appears as a plosive in Gothic waurd "word" (not *waurþ, with devoicing), but as a fricative in Old Norse orð. /d/ hardened to [d] in all positions in the West Germanic languages. In other positions, fricatives occurred singly after vowels and diphthongs, and after non-nasal consonants in the case of /b/ and /ɡ/. Numerous additional changes affected the labiovelar consonants. Even before the operation of Grimm's law, they were reduced to plain velars next to /u/ due to the boukólos rule of PIE. This rule continued to operate as a surface filter, i.e. if a sound change generated a new environment in which a labiovelar occurred near a /u/, it was immediately converted to a plain velar. This caused certain alternations in verb paradigms, such as *singwaną [siŋʷɡʷɑnɑ̃] ‘to sing’ versus *sungun [suŋɡun] ‘they sang’. Apparently, this delabialization also occurred with labiovelars following /un/, showing that the language possessed a labial allophone [ŋʷ] as well. In this case the entire clusters [uŋʷxʷ], [uŋʷkʷ] and [uŋʷɡʷ] are delabialized to [uŋx], [uŋk] and [uŋɡ]. After the operation of Verner's law, various changes conspired to almost completely eliminate voiced labiovelars. Initially, [ɡʷʰ] became [b], e.g. PIE *gʷʱédʱyeti > PGmc. *bidiþi ‘asks for’. The fricative variant [ɣʷ] (which occurred in most non-initial environments) usually became [w], but sometimes instead turned into [ɣ]. The only environment in which a voiced labiovelar remained was after a nasal, e.g. in *singwaną [ˈsiŋʷɡʷɑnɑ̃] ‘to sing’. These various changes often led to complex alternations, e.g. *sehwaną [ˈsexʷɑnɑ̃] ‘to see’, *sēgun [ˈsɛːɣun] ‘they saw’ (indicative), *sēwīn [ˈsɛːwiːn] ‘they saw’ (subjunctive), which were reanalysed and regularised differently in the various daughter languages. Kroonen (2011) posits a process of consonant mutation for Proto-Germanic, under the name consonant gradation. (This is distinct from the consonant mutation processes occurring in the neighboring Samic and Finnic languages, also known as consonant gradation since the 19th century.) The Proto-Germanic consonant gradation is not directly attested in any of the Germanic dialects, but may nevertheless be reconstructed on the basis of certain dialectal discrepancies in root of the n-stems and the ōn-verbs. Diachronically, the rise of consonant gradation in Germanic can be explained by Kluge's law, by which geminates arose from stops followed by a nasal in a stressed syllable. Since this sound law only operated in part of the paradigms of the n-stems and ōn-verbs, it gave rise to an alternation of geminated and non-geminated consonants. However, there has been controversy about the validity of this law, with some linguists preferring to explain the development of geminate consonants with the idea of "expressive gemination". The origin of the Germanic geminate consonants is currently a disputed part of historical linguistics with no clear consensus at present. The reconstruction of grading paradigms in Proto-Germanic explains root alternations such as Old English steorra 'star' < *sterran- vs. Old Frisian stera 'id.' < *steran- and Norwegian (dial.) guva 'to swing' < *gubōn- vs. Middle High German gupfen 'id.' < *guppōn- as generalizations of the original allomorphy. In the cases concerned, this would imply reconstructing an n-stem nom. *sterō, gen. *sterraz < PIE *h₂stér-ōn, *h₂ster-n-ós and an ōn-verb 3sg. *guppōþi, 3pl. *gubunanþi < *gʱubʱ-néh₂-ti, *gʱubʱ-nh₂-énti. Proto-Germanic had four short vowels, five or six long vowels, and at least one "overlong" or "trimoric" vowel. The exact phonetic quality of the vowels is uncertain. /e/ could not occur in unstressed syllables except before /r/, where it may have been lowered to /ɑ/ already in late Proto-Germanic times. All nasal vowels except /ɑ̃ː/ and /ũː/ occurred word-finally. The long nasal vowels /ɑ̃ː/, /ĩː/ and /ũː/ occurred before /x/, and derived from earlier short vowels followed by /nx/. PIE ə, a, o merged into PGmc a; PIE ā, ō merged into PGmc ō. At the time of the merger, the vowels probably were [ɑ] and [ɑː], or perhaps [ɒ] and [ɒː]. Their timbres then differentiated by raising (and perhaps rounding) the long vowel to [ɔː]. It is known that the raising of ā to ō can not have occurred earlier than the earliest contact between Proto-Germanic speakers and the Romans. This can be verified by the fact that Latin Rōmānī later emerges in Gothic as Rumoneis (that is, Rūmōnīs). It is explained by Ringe that at the time of borrowing, the vowel matching closest in sound to Latin ā was a Proto-Germanic ā-like vowel (which later became ō). And since Proto-Germanic therefore lacked a mid(-high) back vowel, the closest equivalent of Latin ō was Proto-Germanic ū: Rōmānī > *Rūmānīz > *Rūmōnīz > Gothic Rumoneis. A new ā was formed following the shift from ā to ō when intervocalic /j/ was lost in -aja- sequences. It was a rare phoneme, and occurred only in a handful of words, the most notable being the verbs of the third weak class. The agent noun suffix *-ārijaz (Modern English -er) was likely borrowed from Latin around or shortly after this time. Note the change /e/ > /i/ before /i/ or /j/ in the same or following syllable. This removed /ei/ (which became /iː/) but created /iu/ from earlier /eu/. Diphthongs in Proto-Germanic can also be analysed as sequences of a vowel plus an approximant, as was the case in Proto-Indo-European. This explains why /j/ was not lost in *niwjaz ("new"); the second element of the diphthong iu was still underlyingly a consonant and therefore the conditioning environment for the loss was not met. This is also confirmed by the fact that later in the West Germanic gemination, -wj- is geminated to -wwj- in parallel with the other consonants (except /r/). Proto-Germanic had two overlong or trimoraic long vowels ô [ɔːː] and ê [ɛːː], the latter mainly in adverbs (cf. *hwadrê ‘whereto, whither’). None of the documented languages still include such vowels. Their reconstruction is due to the comparative method, particularly as a way of explaining an otherwise unpredictable two-way split of reconstructed long ō in final syllables, which unexpectedly remained long in some morphemes but shows normal shortening in others. contraction after loss of laryngeal: gen.pl. *wulfǫ̂ "wolves'" ← *wulfôn ← pre-Gmc *wúlpōom ← PIE *wĺ̥kʷoHom; ō-stem nom.pl. *-ôz ← pre-Gmc *-āas ← PIE *-eh₂es. contraction of short vowels: a-stem nom.pl. *wulfôz "wolves" ← PIE *wĺ̥kʷoes. Trimoraic vowels are distinguished from bimoraic vowels by their outcomes in attested Germanic languages: word-final trimoraic vowels remained long vowels while bimoraic vowels developed into short vowels. Older theories about the phenomenon claimed that long and overlong vowels were both long but differed in tone, i.e., ô and ê had a “circumflex” (rise-fall-rise) tone while ō and ē had an “acute” (rising) tone, much like the tones of modern Scandinavian languages, Baltic, and Ancient Greek, and asserted that this distinction was inherited from PIE. However, this view was abandoned since languages in general do not combine distinctive intonations on unstressed syllables with contrastive stress and vowel length. Modern theories have reinterpreted overlong vowels as having superheavy syllable weight (three moras) and therefore greater length than ordinary long vowels. By the end of the Proto-Germanic period, word-final long vowels were shortened to short vowels. Following that, overlong vowels were shortened to regular long vowels in all positions, merging with originally long vowels except word-finally (because of the earlier shortening), so that they remained distinct in that position. This was a late dialectal development, because the end result was not the same in all Germanic languages: word-final ē shortened to a in East and West Germanic but to i in Old Norse, and word-final ō shortened to a in Gothic but to o (probably [o]) in early North and West Germanic, with a later raising to u (the 6th century Salic law still has maltho in late Frankish). The shortened overlong vowels in final position developed as regular long vowels from that point on, including the lowering of ē to ā in North and West Germanic. The monophthongization of unstressed au in Northwest Germanic produced a phoneme which merged with this new word-final long ō, while the monophthongization of unstressed ai produced a new ē which did not merge with original ē, but rather with ē₂, as it was not lowered to ā. This split, combined with the asymmetric development in West Germanic, with ē lowering but ō raising, points to an early difference in the articulation height of the two vowels that was not present in North Germanic. It could be seen as evidence that the lowering of ē to ā began in West Germanic at a time when final vowels were still long, and spread to North Germanic through the late Germanic dialect continuum, but only reaching the latter after the vowels had already been shortened. ē₂ is uncertain as a phoneme and only reconstructed from a small number of words; it is posited by the comparative method because whereas all provable instances of inherited (PIE) *ē (PGmc. *ē₁) are distributed in Gothic as ē and the other Germanic languages as *ā, all the Germanic languages agree on some occasions of ē (e.g., Goth/OE/ON hēr ‘here‘ ← late PGmc. *hē₂r). Gothic makes no orthographic and therefore presumably no phonetic distinction between ē₁ and ē₂, but the existence of two Proto-Germanic long e-like phonemes is supported by the existence of two e-like Elder Futhark runes, Ehwaz and Eihwaz. ēi: Old High German fiara, fera ‘ham’, Goth fera ‘side, flank’ ← PGmc *fē₂rō ← *pēi-s-eh₂ ← PIE *(s)peh₁i-. iz, after loss of -z: OEng mēd, OHG miata "reward" (vs. OEng meord, Goth mizdō) ← PGmc *mē₂dō ← *mizdō ← PIE *misdʰ-eh₂. Words borrowed from Latin ē or e in the root syllable after a certain period (older loans also show ī). Proto-Germanic developed nasal vowels from two sources. The earlier and much more frequent source was word-final -n (from PIE -n or -m) in unstressed syllables, which at first gave rise to short -ą, -į, -ų, long -į̄, -ę̄, -ą̄, and overlong -ę̂, -ą̂. -ę̄ and -ę̂ then merged into -ą̄ and -ą̂, which later developed into -ǭ and -ǫ̂. Another source, developing only in late Proto-Germanic times, was in the sequences -inh-, -anh-, -unh-, in which the nasal consonant lost its occlusion and was converted into lengthening and nasalisation of the preceding vowel, becoming -ą̄h-, -į̄h-, -ų̄h- (still written as -anh-, -inh-, -unh- in this article). The distinct reflexes of nasal -ǭ versus non-nasal -ō are caused by the Northwest Germanic raising of final -ō /ɔː/ to /oː/, which did not affect -ǭ. When the vowels were shortened and denasalised, these two vowels no longer had the same place of articulation, and did not merge: -ō became /o/ (later /u/) while -ǭ became /ɔ/ (later /ɑ/). This allowed their reflexes to stay distinct. The nasality of word-internal vowels (from -nh-) was more stable, and survived into the early dialects intact. The phonemicity is evident from minimal pairs like ǿ̇ra "younger" vs. ǿra "vex" < *wor-, cognate with English weary. The inherited Proto-Germanic nasal vowels were joined in Old Norse by nasal vowels from other sources, e.g. loss of *n before s. Modern Elfdalian still includes nasal vowels that directly derive from Old Norse, e.g. gą̊s "goose" < Old Norse gás (presumably nasalized, although not so written); cf. German Gans, showing the original consonant. En brought, WFris brocht < Old English brōhte, Old Frisian brōchte < Anglo-Frisian *brą̄htæ < Proto-Germanic *branhtaz (the past participle of *bringaną). The s + voiceless plosive clusters, sp, st, sk, could appear in any position in a word. Due to the emergence of a word-initial stress accent, vowels in unstressed syllables were gradually reduced over time, beginning at the very end of the Proto-Germanic period and continuing into the history of the various dialects. Already in Proto-Germanic, word-final /e/ and /ɑ/ had been lost, and /e/ had merged with /i/ in unstressed syllables. Vowels in third syllables were also generally lost before dialect diversification began, such as final -i of some present tense verb endings, and in -maz and -miz of the dative plural ending and 1st person plural present of verbs. Word-final short nasal vowels were however preserved longer, as is reflected Proto-Norse which still preserved word-final -ą (horna on the Gallehus horns), while the dative plural appears as -mz (gestumz on the Stentoften Runestone). Somewhat greater reduction is found in Gothic, which lost all final-syllable short vowels except u. Old High German and Old English initially preserved unstressed i and u, but later lost them in long-stemmed words and then Old High German lost them in many short-stemmed ones as well, by analogy. Old English shows indirect evidence that word-final -ą was preserved into the separate history of the language. This can be seen in the infinitive ending -an (< *aną) and the strong past participle ending -en (< *-anaz). Since the early Old English fronting of /ɑ/ to /æ/ did not occur in nasalized vowels or before back vowels, this created a vowel alternation because the nasality of the back vowel ą in the infinitive ending prevented the fronting of the preceding vowel: *-aną > *-an, but *-anaz > *-ænæ > *-en. Therefore, the Anglo-Frisian brightening must necessarily have occurred very early in the history of the Anglo-Frisian languages, before the loss of final -ą.
i-stem masculine accusative singular į i? u-stem accusative singular ų u? Note that some Proto-Germanic endings have merged in all of the literary languages but are still distinct in runic Proto-Norse, e.g. *-īz vs. *-ijaz (þrijōz dohtrīz "three daughters" in the Tune stone vs. the name Holtijaz in the Gallehus horns). Reconstructions are tentative and multiple versions with varying degrees of difference exist. All reconstructed forms are marked with an asterisk (*). It is often asserted that the Germanic languages have a highly reduced system of inflections as compared with Greek, Latin, or Sanskrit. Although this is true to some extent, it is probably due more to the late time of attestation of Germanic than to any inherent "simplicity" of the Germanic languages. As an example, there are less than 500 years between the Gothic Gospels of 360 and the Old High German Tatian of 830, yet Old High German, despite being the most archaic of the West Germanic languages, is missing a large number of archaic features present in Gothic, including dual and passive markings on verbs, reduplication in Class VII strong verb past tenses, the vocative case, and second-position (Wackernagel's Law) clitics. Many more archaic features may have been lost between the Proto-Germanic of 200 BC or so and the attested Gothic language. Furthermore, Proto-Romance and Middle Indic of the fourth century AD—contemporaneous with Gothic—were significantly simpler than Latin and Sanskrit, respectively, and overall probably no more archaic than Gothic. In addition, some parts of the inflectional systems of Greek, Latin, and Sanskrit were innovations that were not present in Proto-Indo-European. Proto-Germanic had six cases, three genders, three numbers, three moods (indicative, subjunctive (PIE optative), imperative), and two voices (active and passive (PIE middle)). This is quite similar to the state of Latin, Greek, and Middle Indic of c. AD 200. Nouns and adjectives were declined in (at least) six cases: vocative, nominative, accusative, dative, instrumental, genitive. The locative case had merged into the dative case, and the ablative may have merged with either the genitive, dative or instrumental cases. However, sparse remnants of the earlier locative and ablative cases are visible in a few pronominal and adverbial forms. Pronouns were declined similarly, although without a separate vocative form. The instrumental and vocative can be reconstructed only in the singular; the instrumental survives only in the West Germanic languages, and the vocative only in Gothic. Verbs and pronouns had three numbers: singular, dual, and plural. Although the pronominal dual survived into all the oldest languages, the verbal dual survived only into Gothic, and the (presumed) nominal and adjectival dual forms were lost before the oldest records. As in the Italic languages, it may have been lost before Proto-Germanic became a different branch at all. Several sound changes occurred in the history of Proto-Germanic that were triggered only in some environments but not in others. Some of these were grammaticalised while others were still triggered by phonetic rules and were partially allophonic or surface filters. In the person-and-number endings of verbs, which were voiceless in weak verbs and voiced in strong verbs. Between different grades of strong verbs. The voiceless alternants appeared in the present and past singular indicative, the voiced alternants in the remaining past tense forms. Between strong verbs (voiceless) and causative verbs derived from them (voiced). Between verbs and derived nouns. Between the singular and plural forms of some nouns. The second-person singular past ending *-t of strong verbs. The past tense of weak verbs with no vowel infix in the past tense. Nouns derived from verbs by means of the suffixes *-tiz, *-tuz, *-taz, which also possessed variants in -þ- and -d- when not following an obstruent. An alternation not triggered by sound change was Sievers' law, which caused alternation of suffixal -j- and -ij- depending on the length of the preceding part of the morpheme. If preceded within the same morpheme by only short vowel followed by a single consonant, -j- appeared. In all other cases, such as when preceded by a long vowel or diphthong, by two or more consonants, or by more than one syllable, -ij- appeared. The distinction between morphemes and words is important here, as the alternant -j- appeared also in words that contained a distinct suffix that in turn contained -j- in its second syllable. A notable example was the verb suffix *-atjaną, which retained -j- despite being preceded by two syllables in a fully formed word. Related to the above was the alternation between -j- and -i-, and likewise between -ij- and -ī-. This was caused by the earlier loss of -j- before -i-, and appeared whenever an ending was attached to a verb or noun with an -(i)j- suffix (which were numerous). Similar, but much more rare, was an alternation between -aV- and -aiC- from the loss of -j- between two vowels, which appeared in the present subjunctive of verbs: *-aų < *-ajų in the first person, *-ai- in the others. A combination of these two effects created an alternation between -ā- and -ai- found in class 3 weak verbs, with -ā- < -aja- < -əja- and -ai- < -əi- < -əji-. Verb endings beginning with -i-: present second and third person singular, third person plural. Noun endings beginning with -i- in u-stem nouns: dative singular, nominative and genitive plural. Causatives derived from strong verbs with a -j- suffix. Verbs derived from nouns with a -j- suffix. Nouns derived from verbs with a -j- suffix. Nouns and adjectives derived with a variety of suffixes including -il-, -iþō, -į̄, -iskaz, -ingaz. The system of nominal declensions was largely inherited from PIE. Primary nominal declensions were the stems in /a/, /ō/, /n/, /i/, and /u/. The first three were particularly important and served as the basis of adjectival declension; there was a tendency for nouns of all other classes to be drawn into them. The first two had variants in /ja/ and /wa/, and /jō/ and /wō/, respectively; originally, these were declined exactly like other nouns of the respective class, but later sound changes tended to distinguish these variants as their own subclasses. The /n/ nouns had various subclasses, including /ōn/ (masculine and feminine), /an/ (neuter), and /īn/ (feminine, mostly abstract nouns). There was also a smaller class of root nouns (ending in various consonants), nouns of relationship (ending in /er/), and neuter nouns in /z/ (this class was greatly expanded in German). Present participles, and a few nouns, ended in /nd/. The neuter nouns of all classes differed from the masculines and feminines in their nominative and accusative endings, which were alike. Adjectives agree with the noun they qualify in case, number, and gender. Adjectives evolved into strong and weak declensions, originally with indefinite and definite meaning, respectively. As a result of its definite meaning, the weak form came to be used in the daughter languages in conjunction with demonstratives and definite articles. The terms "strong" and "weak" are based on the later development of these declensions in languages such as German and Old English, where the strong declensions have more distinct endings. In the proto-language, as in Gothic, such terms have no relevance. The strong declension was based on a combination of the nominal /a/ and /ō/ stems with the PIE pronominal endings; the weak declension was based on the nominal /n/ declension. Proto-Germanic originally had two demonstratives (proximal *hi- ‘this’, distal *sa/sō/þat ‘that’) which could serve as both adjectives and pronouns. The proximal was already obsolescent in Gothic (e.g. Goth acc. hina, dat. himma, neut. hita) and appears entirely absent in North Germanic. In the West Germanic languages, it evolved into a third-person pronoun, displacing the inherited *iz in the northern languages while being ousted itself in the southern languages (i.e. Old High German). This is the basis of the distinction between English him/her (with h- from the original proximal demonstrative) and German ihm/ihr (lacking h-). However, many of the tenses of the other languages (e.g. future, future perfect, pluperfect, Latin imperfect) are not cognate with each other and represent separate innovations in each language. For example, the Greek future uses a -s- ending, apparently derived from a desiderative construction that in PIE was part of the system of derivational morphology (not the inflectional system); the Sanskrit future uses a -sy- ending, from a different desiderative verb construction and often with a different ablaut grade from Greek; while the Latin future uses endings derived either from the PIE subjunctive or from the PIE verb */bʱuː/ "to be". Similarly, the Latin imperfect and pluperfect stem from Italic innovations and are not cognate with the corresponding Greek or Sanskrit forms; and while the Greek and Sanskrit pluperfect tenses appear cognate, there are no parallels in any other Indo-European languages, leading to the conclusion that this tense is either a shared Greek-Sanskrit innovation or separate, coincidental developments in the two languages. In this respect, Proto-Germanic can be said to be characterized by the failure to innovate new synthetic tenses as much as the loss of existing tenses. Later Germanic languages did innovate new tenses, derived through periphrastic constructions, with Modern English likely possessing the most elaborated tense system ("Yes, the house will still be being built a month from now"). On the other hand, even the past tense was later lost (or widely lost) in most High German dialects as well as in Afrikaans. Verbs in Proto-Germanic were divided into two main groups, called "strong" and "weak", according to the way the past tense is formed. Strong verbs use ablaut (i.e. a different vowel in the stem) and/or reduplication (derived primarily from the Proto-Indo-European perfect), while weak verbs use a dental suffix (now generally held to be a reflex of the reduplicated imperfect of PIE *dheH1- originally "put", in Germanic "do"). Strong verbs were divided into seven main classes while weak verbs were divided into five main classes (although no attested language has more than four classes of weak verbs). Strong verbs generally have no suffix in the present tense, although some have a -j- suffix that is a direct continuation of the PIE -y- suffix, and a few have an -n- suffix or infix that continues the -n- infix of PIE. Almost all weak verbs have a present-tense suffix, which varies from class to class. An additional small, but very important, group of verbs formed their present tense from the PIE perfect (and their past tense like weak verbs); for this reason, they are known as preterite-present verbs. All three of the previously mentioned groups of verbs—strong, weak and preterite-present—are derived from PIE thematic verbs; an additional very small group derives from PIE athematic verbs, and one verb *wiljaną "to want" forms its present indicative from the PIE optative mood. Proto-Germanic verbs have three moods: indicative, subjunctive and imperative. The subjunctive mood derives from the PIE optative mood. Indicative and subjunctive moods are fully conjugated throughout the present and past, while the imperative mood existed only in the present tense and lacked first-person forms. Proto-Germanic verbs have two voices, active and passive, the latter deriving from the PIE mediopassive voice. The Proto-Germanic passive existed only in the present tense (an inherited feature, as the PIE perfect had no mediopassive). On the evidence of Gothic—the only Germanic language with a reflex of the Proto-Germanic passive—the passive voice had a significantly reduced inflectional system, with a single form used for all persons of the dual and plural. Note that, although Old Norse (like modern Faroese and Icelandic) has an inflected mediopassive, it is not inherited from Proto-Germanic, but is an innovation formed by attaching the reflexive pronoun to the active voice. *bītaną (class 1) "to bite" → *baitijaną "to bridle, yoke, restrain", i.e. "to make bite down"
*rīsaną (class 1) "to rise" → *raizijaną "to raise", i.e. "to cause to rise"
*beuganą (class 2) "to bend" → *baugijaną "to bend (transitive)"
*brinnaną (class 3) "to burn" → *brannijaną "to burn (transitive)"
*frawerþaną (class 3) "to perish" → *frawardijaną "to destroy", i.e. "to cause to perish"
*nesaną (class 5) "to survive" → *nazjaną "to save", i.e. "to cause to survive"
*ligjaną (class 5) "to lie down" → *lagjaną "to lay", i.e. "to cause to lie down"
*grētaną (class 7) "to weep" → *grōtijaną "to cause to weep"
*lais (class 1, preterite-present) "(s)he knows" → *laizijaną "to teach", i.e. "to cause to know"
As in other Indo-European languages, a verb in Proto-Germanic could have a preverb attached to it, modifying its meaning (cf. e.g. *fra-werþaną "to perish", derived from *werþaną "to become"). In Proto-Germanic, the preverb was still a clitic that could be separated from the verb (as also in Gothic, as shown by the behavior of second-position clitics, e.g. diz-uh-þan-sat "and then he seized", with clitics uh "and" and þan "then" interpolated into dis-sat "he seized") rather than a bound morpheme that is permanently attached to the verb. At least in Gothic, preverbs could also be stacked one on top of the other (similar to Sanskrit, different from Latin), e.g. ga-ga-waírþjan "to reconcile". An example verb: *nemaną "to take" (class 4 strong verb). August Schleicher wrote a fable in the PIE language he had just reconstructed, which though it has been updated a few times by others still bears his name. Below is a rendering of this fable into Proto-Germanic. The first is a direct phonetic evolution of the PIE text. It does not take into account various idiomatic and grammatical shifts that occurred over the period. For example, the original text uses the imperfect tense, which disappeared in Proto-Germanic. The second version takes these differences into account, and is therefore closer to the language the Germanic people would have actually spoken. *Awiz ehwōz-uh: awiz, hwisi wullō ne est, spihi ehwanz, ainą kurų wagą wegandų, ainą-uh mekǭ burą, ainą-uh gumanų ahu berandų. Awiz nu ehwamaz wiuhi: hert agnutai mek, witandī ehwanz akandų gumanų. Ehwōz weuhą: hludi, awi! hert agnutai uns witundumaz: gumô, fadiz, wullǭ awją hwurniudi sibi warmą westrą. Awją-uh wullō ne isti. Þat hehluwaz awiz akrą buki. *Awiz ehwōz-uh: awiz, sō wullǭ ne habdē, sahw ehwanz, ainanǭ kurjanǭ wagną teuhandų, ainanǭ-uh mikilǭ kuriþǭ, ainanǭ-uh gumanų sneumundô berandų. Awiz nu ehwamaz sagdē: hertô sairīþi mek, sehwandē ehwanz akandų gumanų. Ehwōz sagdēdun: gahauzī, awi! hertô sairīþi uns sehwandumiz: gumô, fadiz, uz awīz wullō wurkīþi siz warmą wastijǭ. Awiz-uh wullǭ ne habaiþi. Þat hauzidaz awiz akrą flauh. The Sheep and the Horses: a sheep that had no wool saw horses, one pulling a heavy wagon, one carrying a big load, and one carrying a man quickly. The sheep said to the horses: "My heart pains me, seeing a man driving horses". The horses said: "Listen, sheep, our hearts pain us when we see this: a man, the master, makes the wool of the sheep into a warm garment for himself. And the sheep has no wool". Having heard this, the sheep fled into the plain. ^ While the details of the reconstructed pronunciation vary somewhat, this phonological system is generally agreed upon; for example, coronals are sometimes listed as dentals and alveolars while velars and labiovelars are sometimes combined under dorsals. ^ See e.g. Bloomfield, Leonard (1984). Language. Chicago and London: The University of Chicago Press. pp. 298–299. ISBN 0-226-06067-5. ^ a b c d "Languages of the World: Germanic languages". The New Encyclopædia Britannica. Chicago, IL, United States: Encyclopædia Britannica, Inc. 1993. ISBN 0-85229-571-5. ^  Frederik Kortlandt: The spread of the Indo-Europeans, 1989 : "It is possible [...] that Germanic grew out of a later component of the Corded Ware horizon." ^ Kinder, Hermann; Werner Hilgemann (1988). The Penguin atlas of world history. 1. Translated by Ernest A. Menze. Harald and Ruth Bukor (Maps). Harmondsworth: Penguin Books. p. 109. ISBN 0-14-051054-0. ^ see, for example, Ringe, From Proto-Indo-European to Proto-Germanic, OUP (2006), 296. ^ Nakhleh, Luay; Ringe, Don; Warnow, Tandy (June 2005). "Perfect Phylogenetic Networks: A New Methodology for Reconstructing the Evolutionary History of Natural Languages" (PDF). Language — Journal of the Linguistic Society of America. 81 (2): 1, 10. Retrieved 2016-10-13. The Germanic subfamily especially seemed to exhibit non-treelike behavior, evidently acquiring some of its characteristics from its neighbors rather than (only) from its direct ancestors. [...] [T]he internal diversification of West Germanic is known to have been radically non-treelike [...]. ^ Described in this and the linked articles, but see Kleinman. ^ Lehmann, W. P. (January–March 1961). "A Definition of Proto-Germanic: A Study in the Chronological Delimitation of Languages". Language. 37 (1): 67–74. doi:10.2307/411250. ^ Bennett, William H. (May 1970). "The Stress Patterns of Gothic". PMLA. 85 (3): 463–472. doi:10.2307/1261448. JSTOR 1261448. First page and abstract no charge. ^ Antonsen, Elmer H. (January–March 1965). "On Defining Stages in Prehistoric German". Language. 41 (1): 19–36. doi:10.2307/411849. ^ Antonsen, Elmer H. (2002). Runes and Germanic Linguistics. Walter de Gruyter. pp. 26–30. ISBN 3-11-017462-6. That presentation also summarizes Lehmann's view. ^ Antonsen (2000) page 28 table 9. ^ a b Aikio, Ante (2006). "On Germanic-Saami contacts and Saami prehistory". Suomalais-Ugrilaisen Seuran Aikakauskirja. 91: 9–55. ^ Ringe 2006, p. 296; Lane, George S (1933). "The Germano-Celtic Vocabulary". Language. 9: 244–264. doi:10.2307/409353. ^ Watkins, Calvert (2000). "Appendix I: Indo-European Roots: reg-". The American Heritage Dictionary of the English Language: Fourth Edition. ^ The etymologies are to be found mainly in Green, Dennis Howard (2000). Language and History in the Early Germanic World. Cambridge: Cambridge University Press. pp. 149–164. One is in Ringe 2006, p. 296. ^ Martin Schwartz, "Avestan Terms for the Sauma Plant", Haoma and Harmaline (Berkeley: University of California Press, 1989), 123. ^ Orel 2003, *paido-. That word gave Old English pād, Old Saxon pēda, Old High German pfeit, Bavarian Pfoad, Gothic paida 'coat'. ^ The preceding etymologies come from Orel 2003, which is arranged in alphabetic order by root. ^ Cunliffe, Barry (2008). Europe Between the Oceans 9000 BC – AD 1000. New Haven: Yale University Press. pp. 303–7, 352. ^ Kylstra, A.D.; Hahmo, Sirkka-Liisa; Hofstra, Tette; Nikkilä, Osmo (1991–2012). Lexikon der älteren germanischen Lehnwörter in den ostseefinnischen Sprachen. Amsterdam–Atlanta: Rodopi. ^ Kallio, Petri (2012). "The Prehistoric Germanic Loanword Strata in Finnic". A Linguistic Map of Prehistoric Northern Europe (PDF). Suomalais-Ugrilaisen Seuran Toimituksia. Suomalais-Ugrilainen Seura. ISBN 978-952-5667-42-4. Retrieved 2017-04-04. ^ Vladimir Orel, A Handbook of Germanic Etymology (Leiden, Netherlands: Brill, 2003), 251. ^ On eu and iu see Cercignani 1973. ^ Van Kerckvoorde, Colette M. (1993). An Introduction to Middle Dutch. Berlin and New York: Mouton de Gruyter. p. 123. ISBN 3-11-013535-3. ^ McMahon, April M. S. (1994). Understanding Language Change. Cambridge University Press. p. 227. ISBN 0-521-44665-1. ^ Trask, Robert Lawrence (2000). The Dictionary of Historical and Comparative Linguistics. Chicago, London: Fitzroy Dearborn. p. 122. ISBN 1-57958-218-4. ^ Kraehenmann, Astrid (2003). Quantity and Prosodic Asymmetries is Alemannic: Synchronic and Diachronic. Berlin and New York: Mouton de Gruyter. p. 58. ISBN 3-11-017680-7. ^ Kroonen, Guus. 2011. The Proto-Germanic n-stems : a study in diachronic morphophonology. Amsterdam/New York. ^ On i and e see Cercignani 1979. ^ Benjamin W. Fortson IV, Indo-European Language and Culture: An Introduction, 2nd edn. (Chichester/Malden, MA: Wiley-Blackwell, 2010), 342. ^ Liberman, Anatoly (1982). Germanic Accentology. Minneapolis: University of Minnesota Press. p. 140. ^ Purczinsky, Julius (1993). "Proto-Indo-European Circumflex Intonation or Bisyllabicity". Word. 44 (1): 53. ^ Lehmann, Winfred P. (2007). "The Origin of PGmc. Long Close e". Proto-Indo-European phonology. Austin: Linguistics Research Center. ^ a b Guus Kroonen, Etymological Dictionary of Proto-Germanic (Leiden: Brill, 2013), xxiii-iv, 225. ^ Einar Haugen, "First Grammatical Treatise. The Earliest Germanic Phonology", Language, 26:4 (Oct–Dec, 1950), pp. 4–64 (p. 33). ^ Ringe, Donald (2006). From Proto-Indo-European to Proto-Germanic. Oxford University Press. ISBN 0-19-928413-X. Cercignani, Fausto (1972). "Indo-European ē in Germanic". Zeitschrift für vergleichende Sprachforschung. 86 (1): 104–110. Cercignani, Fausto (1973). "Indo-European eu in Germanic". Indogermanische Forschungen. 78: 106–112. Cercignani, Fausto (1979). "Proto-Germanic */i/ and */e/ Revisited". Journal of English and Germanic Philology. 78 (1): 72–82. Orel, Vladimir (2003). A Handbook of Germanic Etymology. Leiden; Boston; Internet: Brill; Internet Archive. Plotkin, Vulf (2008). The Evolution of Germanic Phonological Systems: Proto-Germanic, Gothic, West Germanic, and Scandinavian. Lewiston: Edwin Mellen. Ringe, Donald A. (2006). From Proto-Indo-European to Proto-Germanic. Linguistic history of English, v. 1. Oxford: Oxford University Press. ISBN 0-19-955229-0. Charles Prescott. 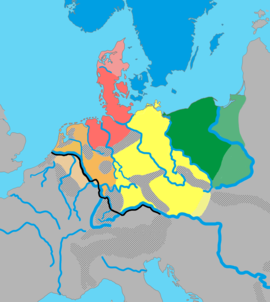 "Germanic and the Ruki Dialects"
This page was last edited on 24 March 2019, at 07:51 (UTC).